We didn’t rack up much distance on the first day, thanks to a lazy start and the steep climb. We also stopped off for one last bit of sightseeing later in the day. 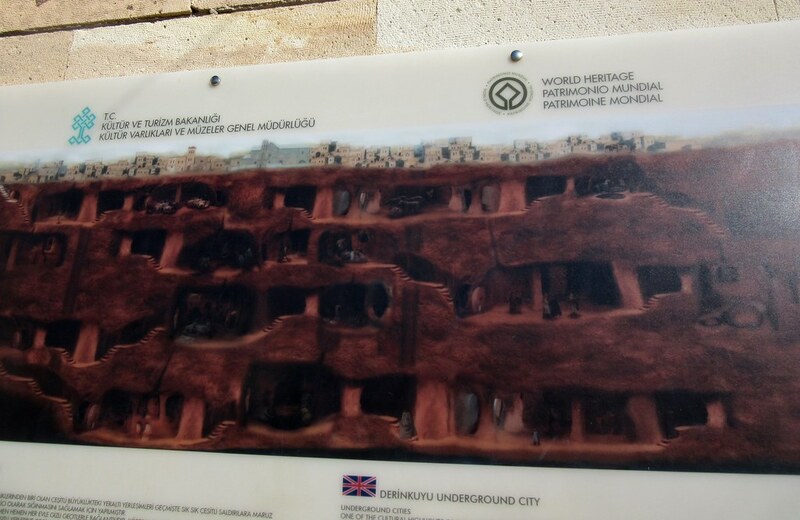 In Cappadocia there are several underground cities, the biggest of which is at Derinkuyu. We went down for a look which was interesting, although we’re pretty bad when it comes to reading the information boards at these kind of places, but we gathered that a lot of people lived in the caves, some years ago. 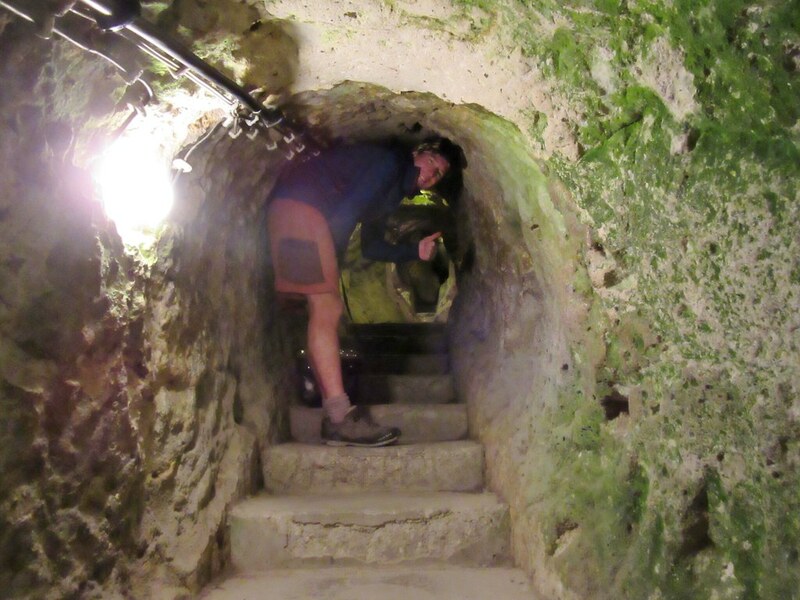 A series of chambers and super tight tunnels went down 8 storeys under the ground, which wouldn’t have been much fun for anyone with claustrophobia. 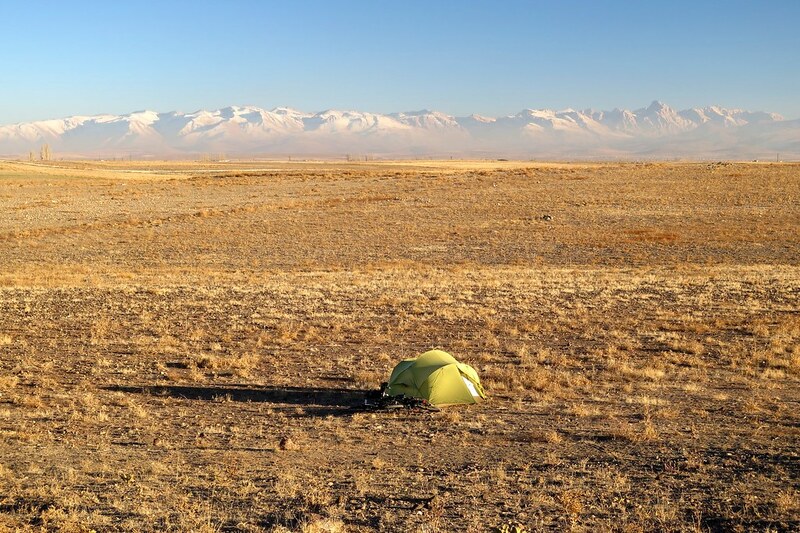 It was late in the afternoon when we left, so we started looking for somewhere to camp as soon as we got out of Derinkuyu. 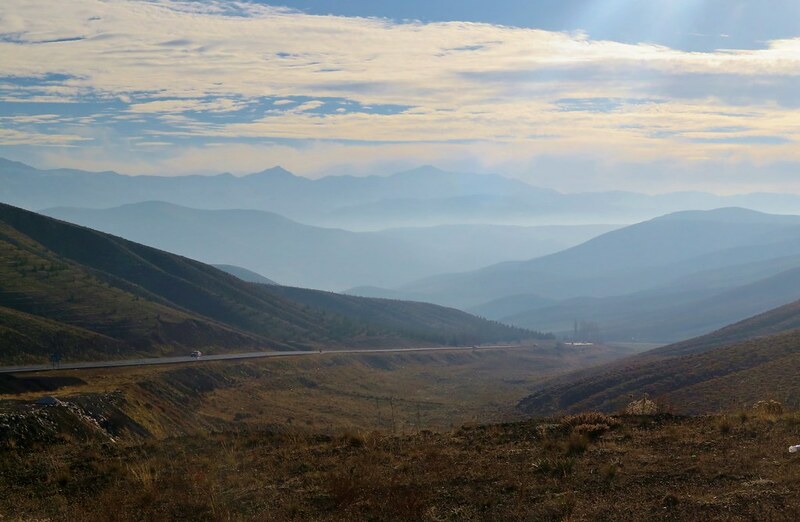 The road went across a big empty plain, climbing towards some snowy mountains. We were already quite high, so didn’t want to be sleeping any higher. We took a dirt track off the main road which went into a dip after a few hundred metres. We pitched the tent there and had some dinner enjoying the view of the mountains and amazing alpenglow from the setting sun. 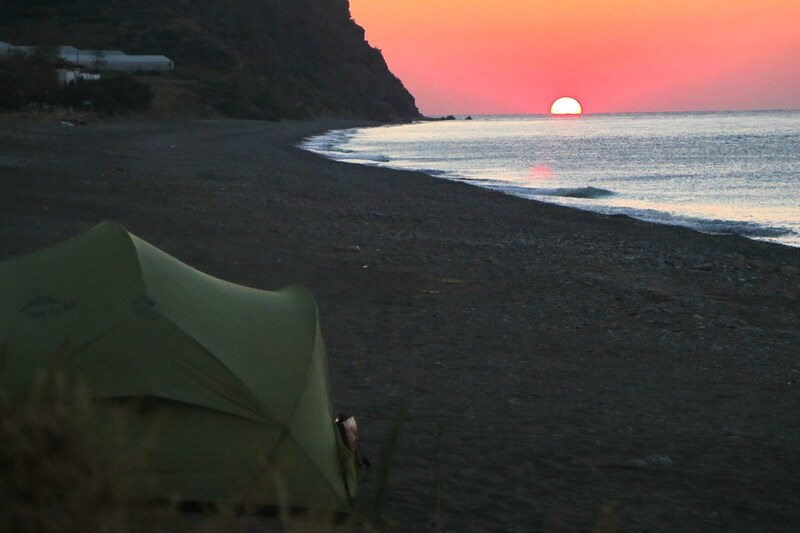 We got inside and into our sleeping bags as soon as the sun dipped below the horizon. It was a cold night, the coldest we’ve had, the temperature inside the tent dipped below -5 and everything was covered in a thick frost come the morning. Our water bottles were frozen and a metal flask that I’d left outside had cracked open from the expanding ice. Once the sun hit the tent we started to warm up, so packed up quickly to hit the road. 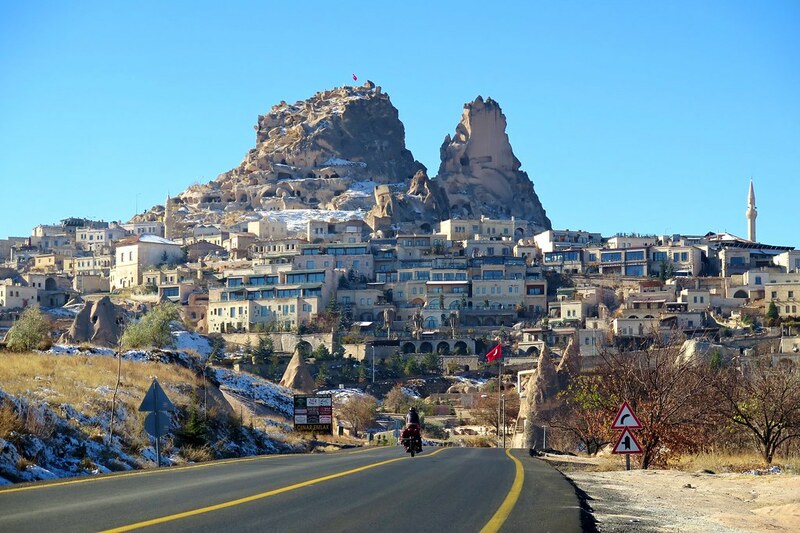 We started with a gradual descent, which was very cold on the hands and feet, taking us to the town of Nigde. Then we hit the mountains we’d seen in the distance and had a couple of passes to cross in the afternoon. We were keen to get up and over into the next valley before the end of the day as we didn’t fancy another freezing night. After a good couple of hours of uphill, we reached the top of the second pass and saw the road stretching away into the valley below us. We coasted down for a long time, feeling warmer the lower we got. 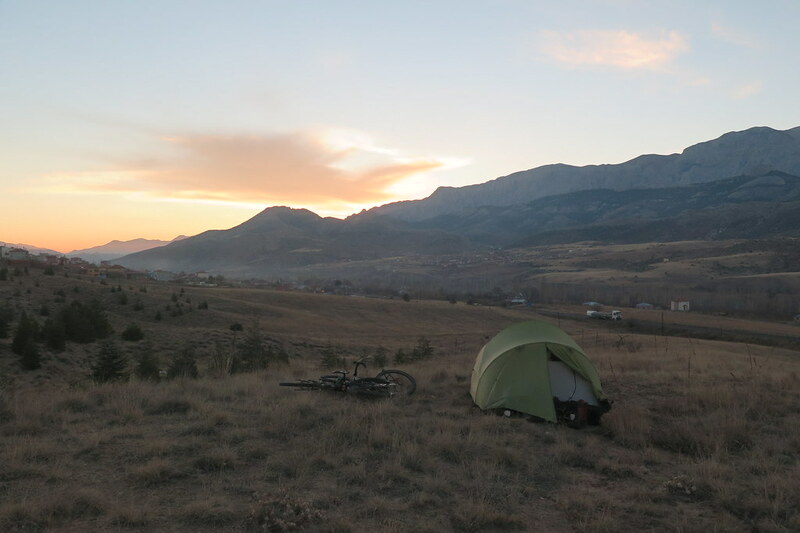 We lost the sun when it went behind the mountains so we filled up on water at a gas station and put the tent up in a spot we hoped would catch the morning sun. 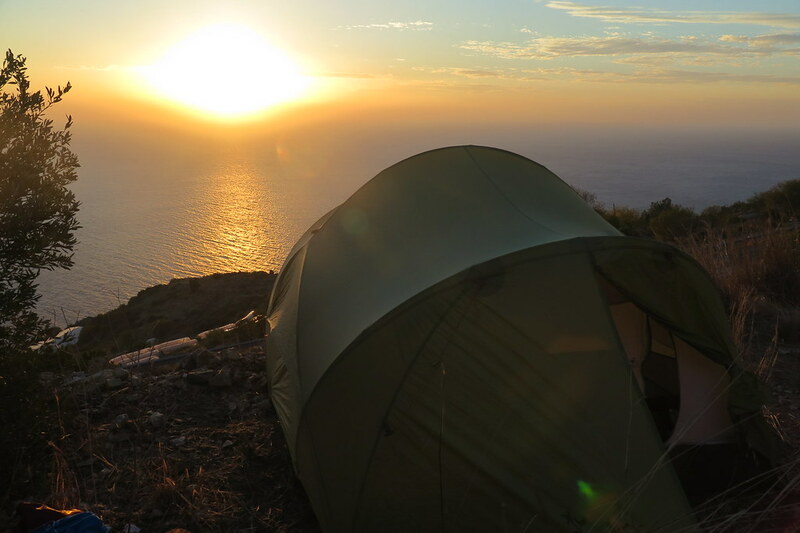 It wasn’t as cold as the previous night, about zero in the tent, but we were glad of the suns rays in the morning. We hadn’t realised that we had a lot more downhill to come. From where we camped, the road would follow the valley down for another 30km or so. This was good and bad. Good, as it was easy distance, and a very scenic start to the day. 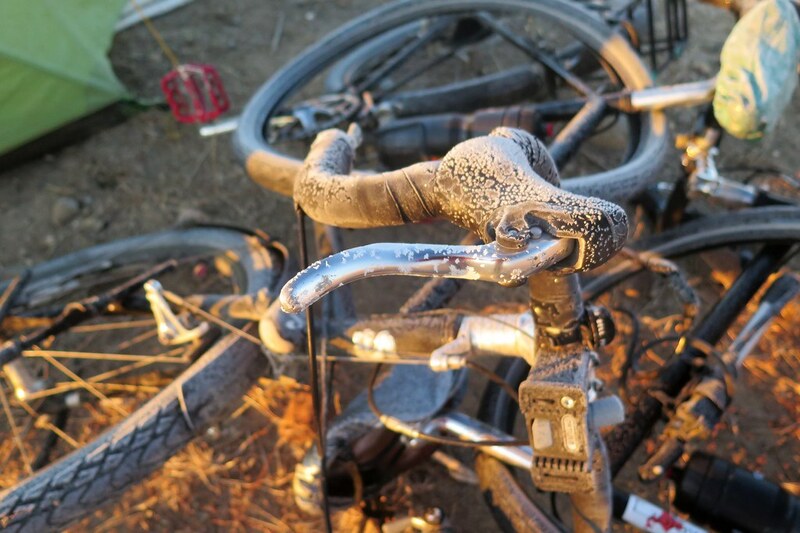 Bad, because we were riding fast and mostly in the shade. Super cold, even wearing down jackets and double gloves! 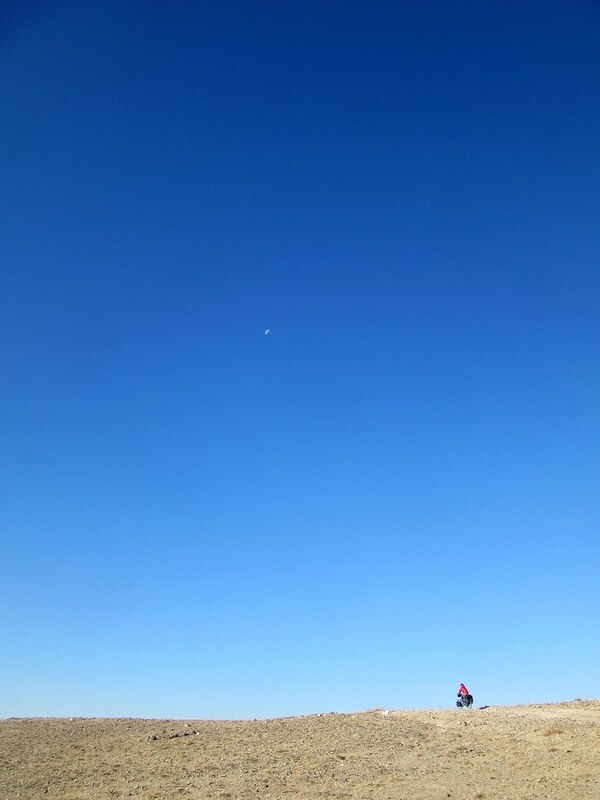 When we reached the flat, we had lost about 1,000 metres of altitude. We stopped at a petrol station for a coffee and to warm up in the sun. We were getting close to the sea by this point, only 50km or so in a straight line. We had one more ridge to cross though. This area was different from the high ground further north. It was much greener and the hills were covered in thick pine forests. It’s amazing how much the scenery changes here, and in such a short distance. It was a slow climb, very steep at points, up to a pass at 1,370 metres. 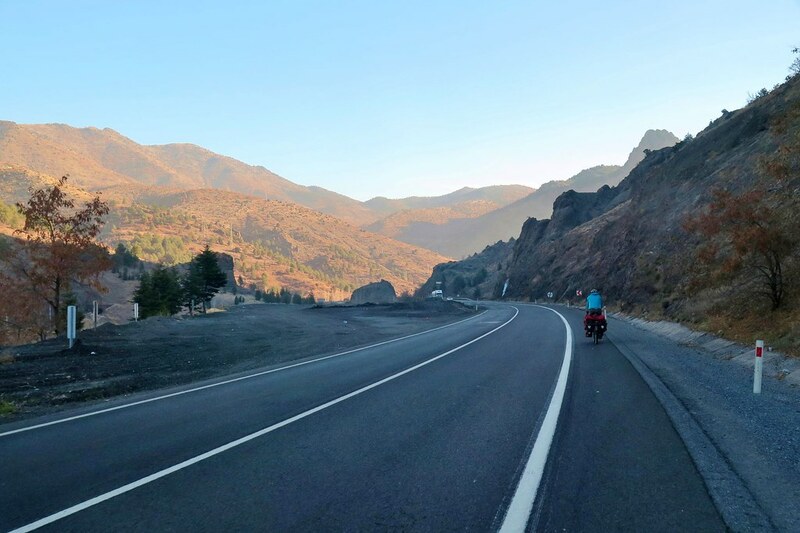 It was really nice riding though, most of the traffic had split off to take the motorway through a tunnel, so our road was very quiet and we took our time enjoying the peace in the mountains. At the pass, we hoped to see the sea in the distance, but it was hidden in the haze. We didn’t see any more mountains to the south though, so we knew it was downhill all the way. We camped a little way down from the pass, in a pine forest below some limestone cliffs. The next day we continued downhill, leaving the forests behind to be replaced by fruit trees and greenhouses. 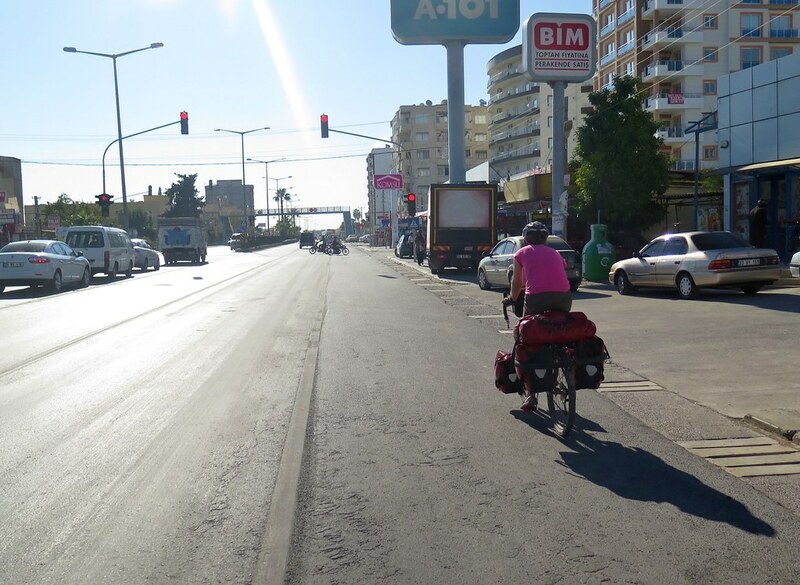 Further on, we joined the coast road near Adana and turned right towards Mersin. We were now into a more urban area, a busy road lined with factories, shops and garages. 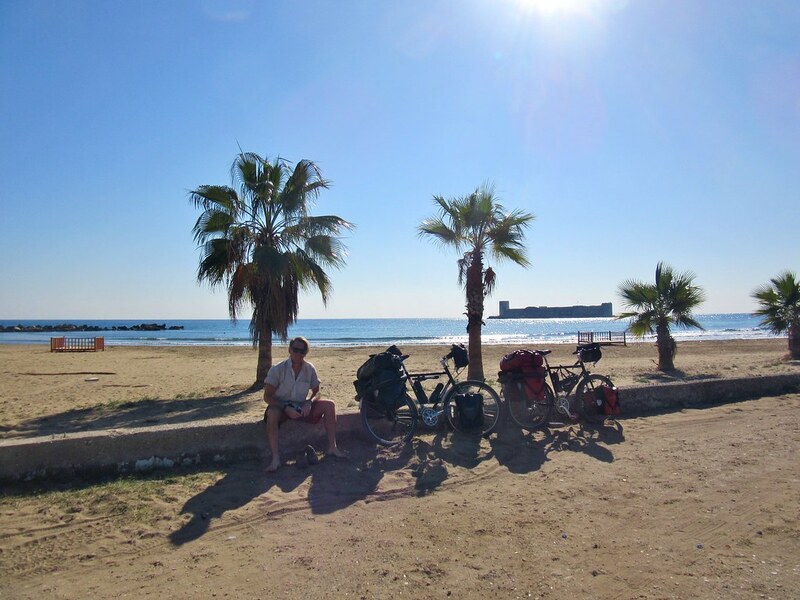 Not much fun, but luckily we had a strong tailwind which pushed us along, getting us into Mersin by lunchtime. There wasn’t much of interest in the city, but we had a day off there, celebrating the fact that we’d reached the Mediterranean. 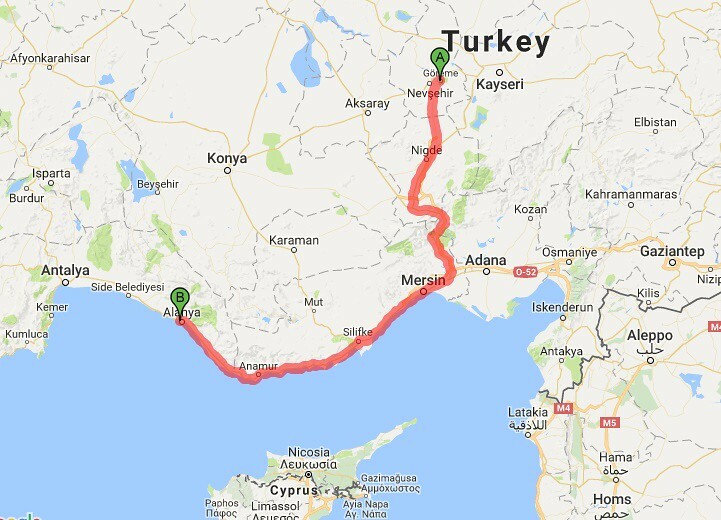 We’d been worried about crossing through central Turkey this late in the year, so reaching the warmer weather in the south was a big target. 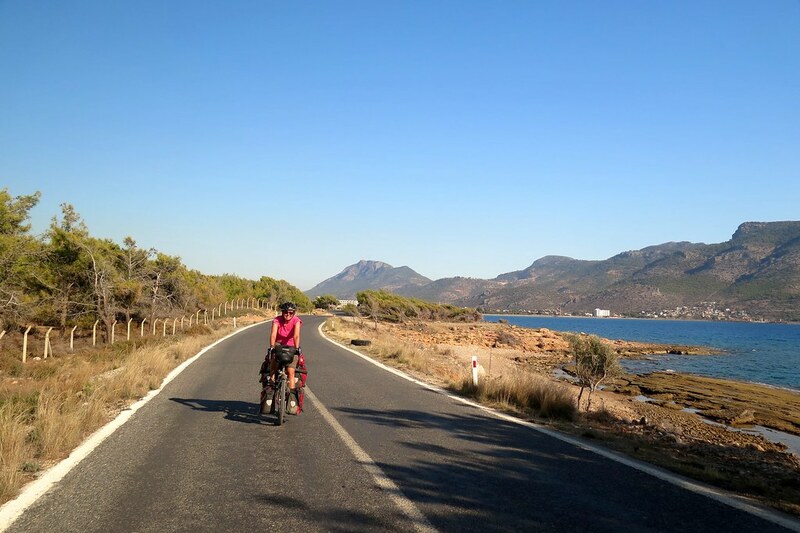 From here on, we don’t have any time limits, we’ll just be cycling along the coast, enjoying the ride. Rested and in good spirits we set off to the west. It took a while to get away from the city, but once we did, it was all good. 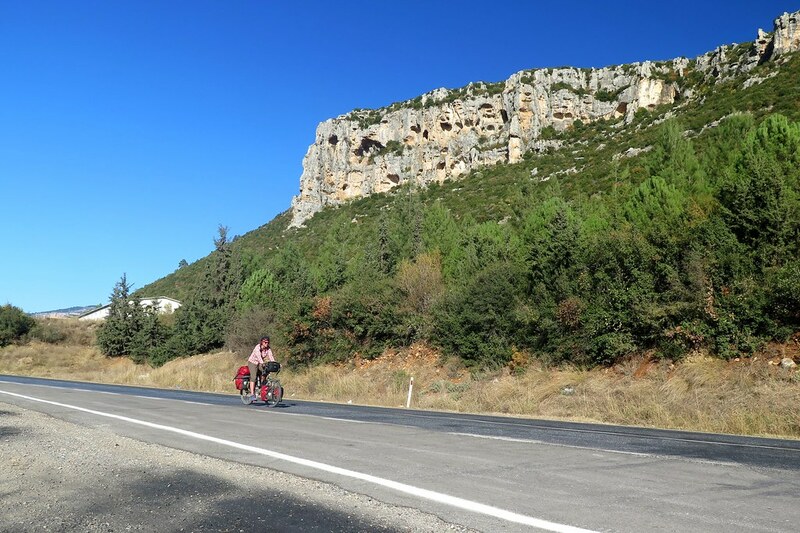 The first 100km from Mersin was quite flat, and we had a couple of shorter days, stopping regularly for breaks on beaches and even the odd swim. We stopped at Kizkalesi, a castle built as a prison on a small island just offshore. 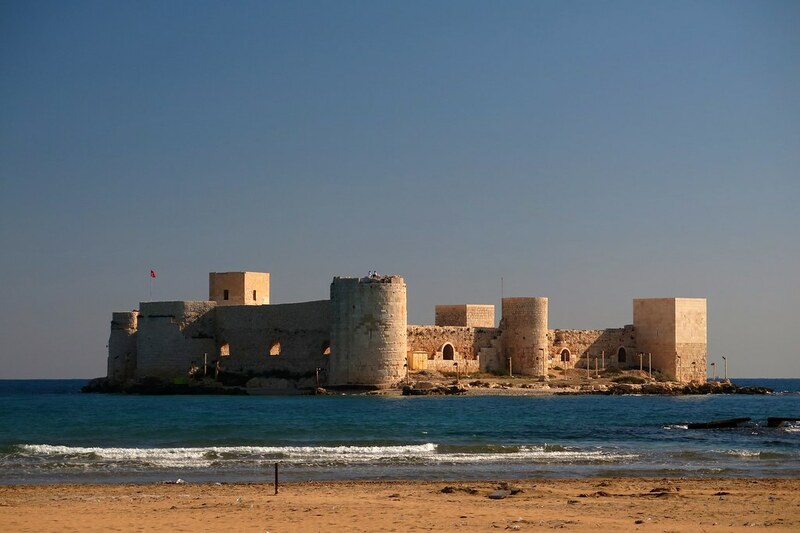 There is a small resort town there, which also has a castle, a couple of beaches and a load of hotels and restaurants. 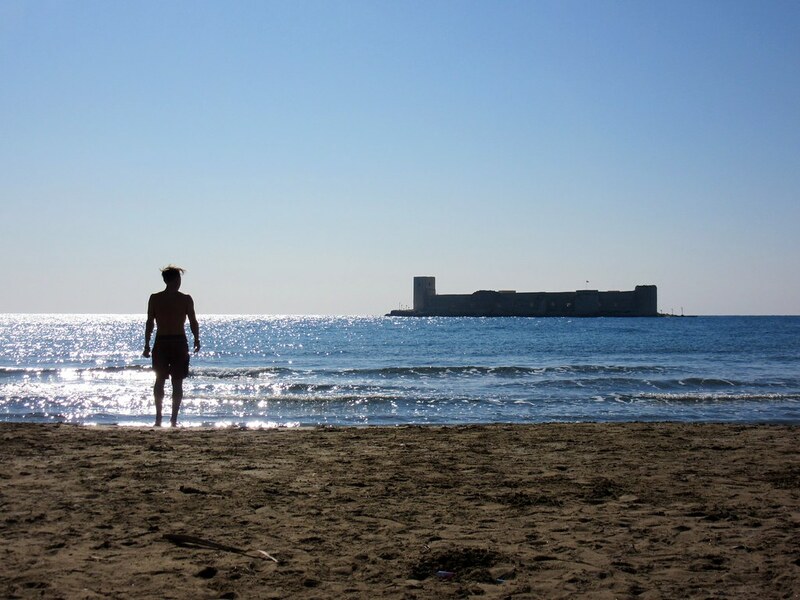 Being November, most places were shut and the beaches were empty. We found a place that was serving food and, after a long lunch, decided that 20km was enough to have cycled for that day. 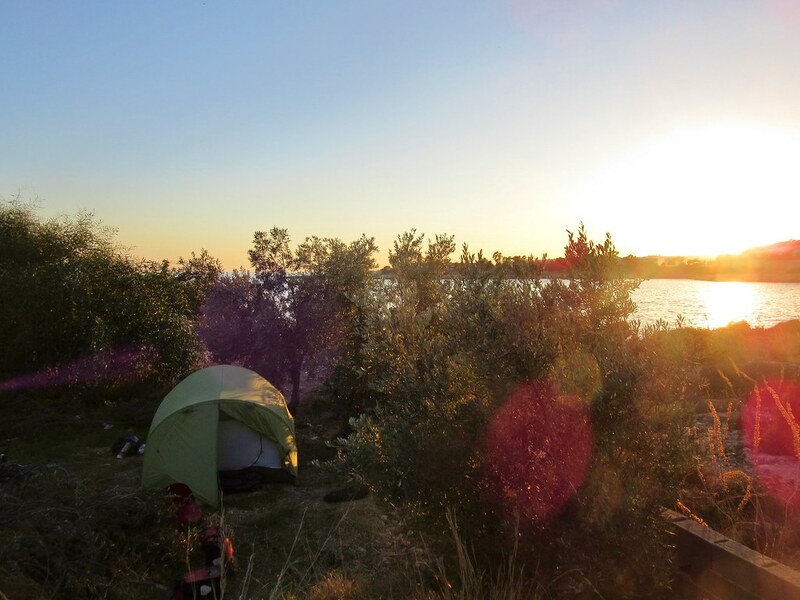 We camped on the edge of an olive grove next to the sea. 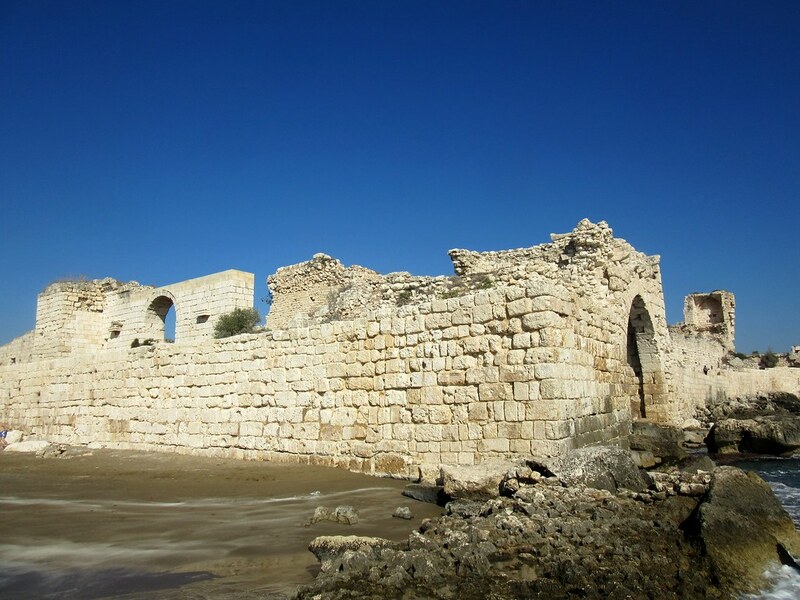 West of Kizkalesi, the road started heading occasionally inland, up and over small rises before returning to the sea. 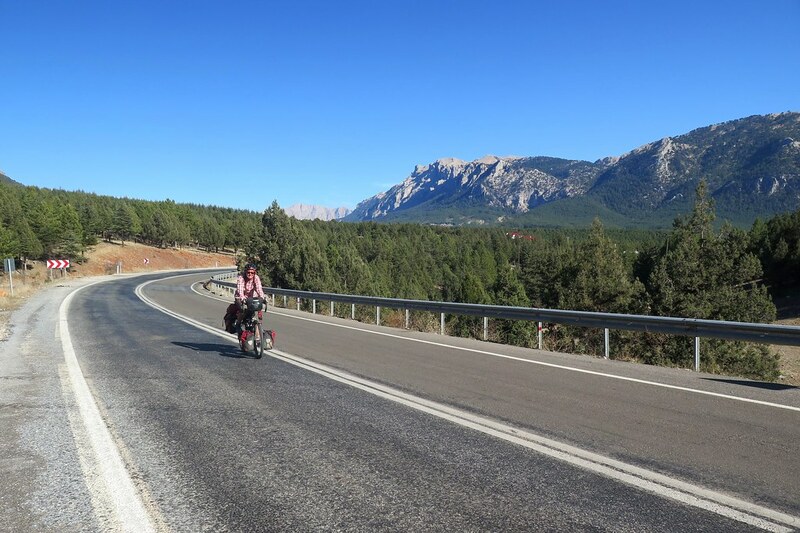 Sometimes we’re on a wide dual carriageway with tunnels, and sometimes on a narrow windy road. They’re improving this road slowly and in sections. 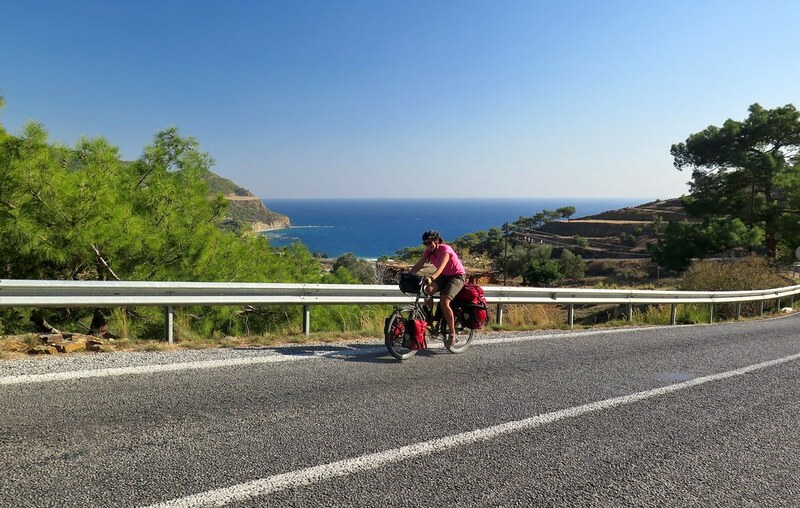 After quite a long stretch of dual carriageway with not much around we head off on a smaller road to the fishing town of Ovacik to find some lunch. Again, it didn’t take much for us to decide we’d done enough riding for the day. 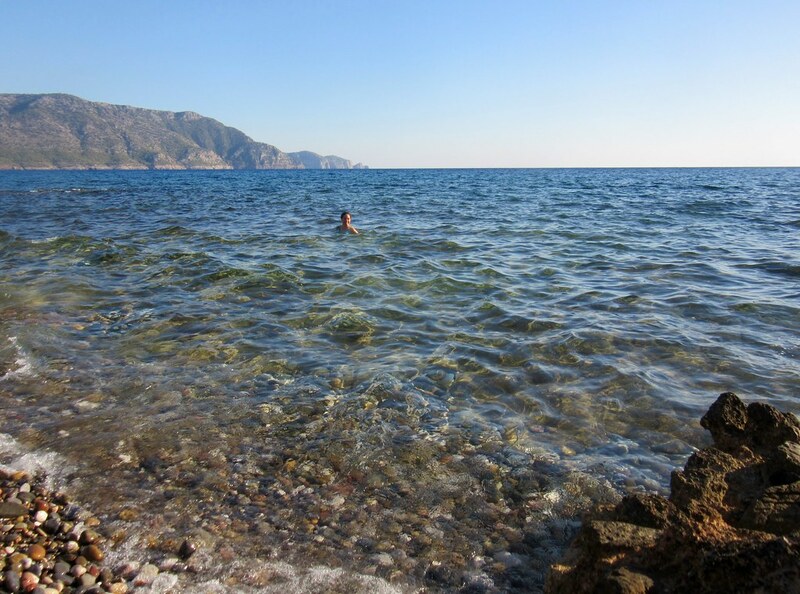 The road leaving Ovacik ran next to the rocks and the sea was just too tempting on a warm afternoon, so we pulled over and went for a swim. It was a quiet spot, so we hung around for a bit then pitched the tent for the night. We’d spotted on the weather forecast that there was rain and wind coming in a couple of days, so we looked ahead on the map. 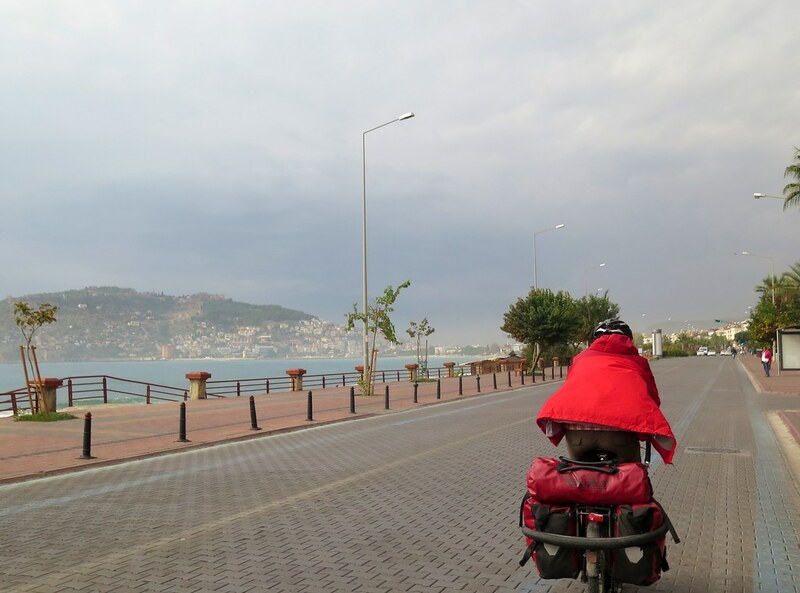 Alanya looked like a place we could get some cheap accomodation to sit out the bad weather, so we set our sights on getting there within two days. 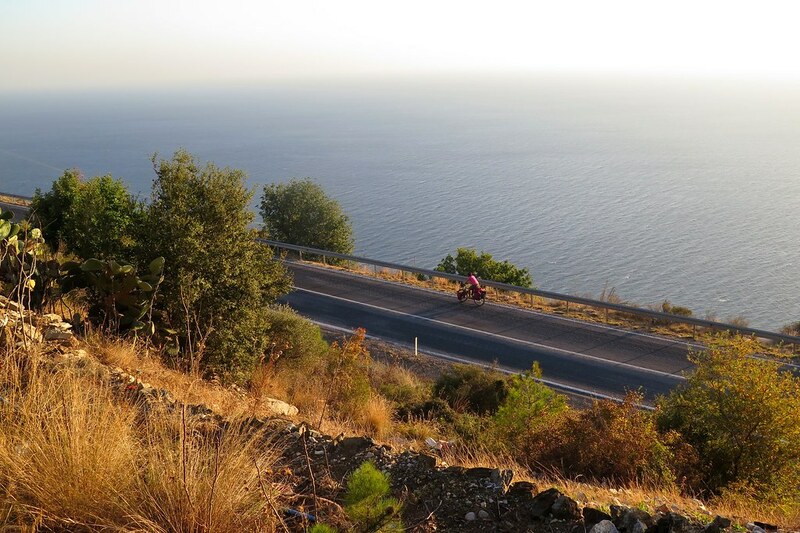 On paper, that shouldn’t have been much of a challenge, but the coast road looked very wiggly between us and Alanya. We set off hoping to cover a decent distance that day, and to start with, made good progress. The coastline started to look rockier and the road rose and fell next to the cliffs. 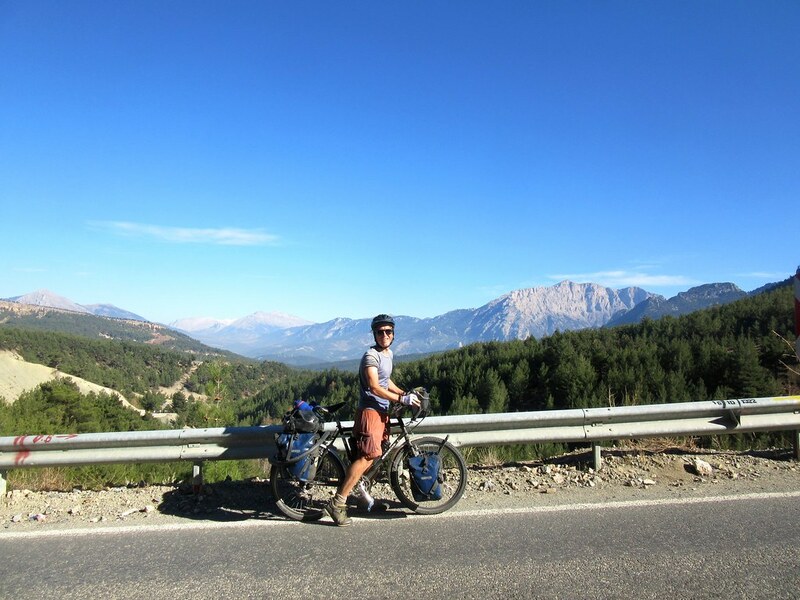 We stopped for a tea break overlooking a crystal clear bay, then soon after setting off again, we met another cyclist coming the other way. He was Dominic, from the UK, and he’s been touring since 2011, mostly through the Americas and Europe. 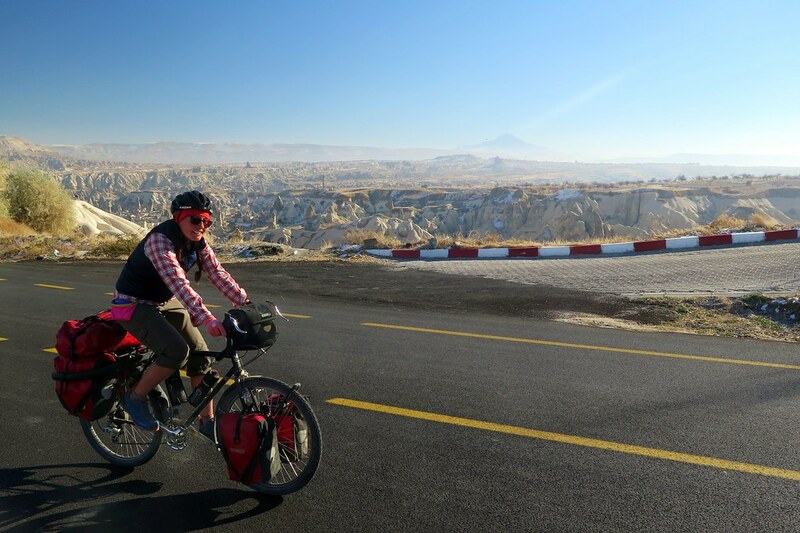 Now that we’ve been on the road for over a year, we’ve started to feel like we’re old hands and that most other cyclists that we’ve met have been on shorter trips. This time though, we were definitely the newcomers! We chatted for quite a while, as it’s always nice to meet a fellow Brit. He said the road ahead got a lot steeper, and he wasn’t kidding. 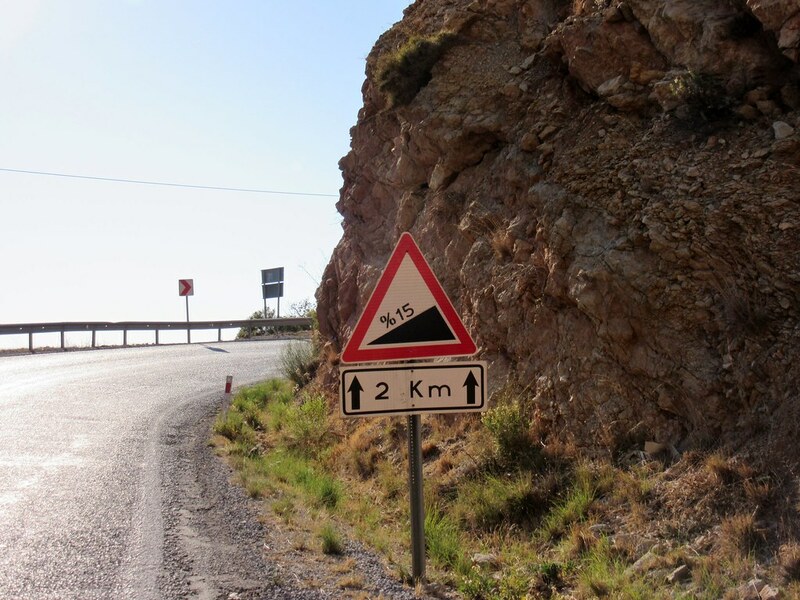 Soon after setting off again we saw a sign for a 15% climb. 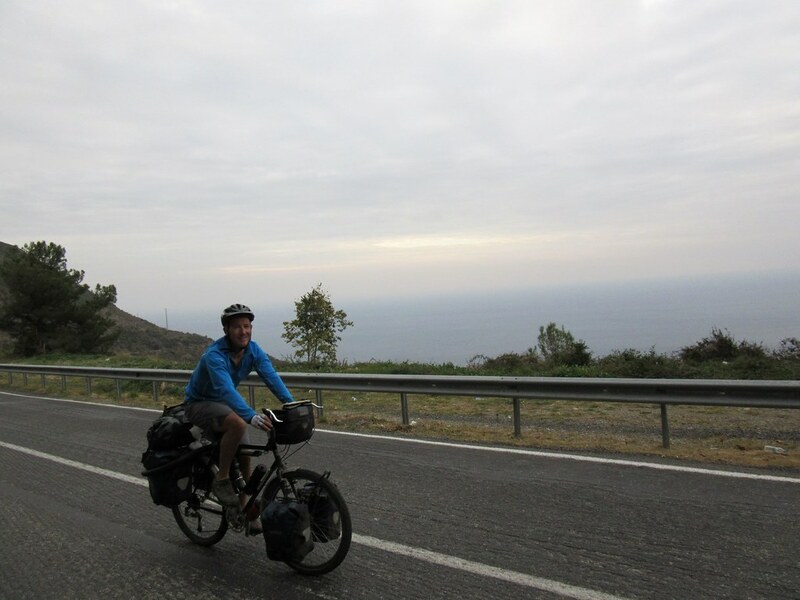 After the long breaks and then slowing to a crawl to take on the steep climb, we weren’t making fast progress towards Alanya. For the next 150km over a couple of days, we were either climbing up steep roads to reach the clifftops, or racing back down to sea level. 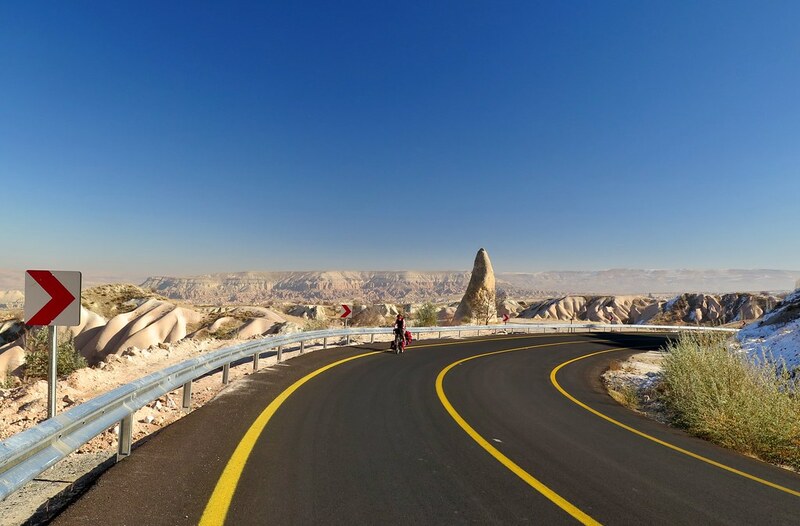 It was an amazing road, absolutely beautiful, but slow going and really tiring! 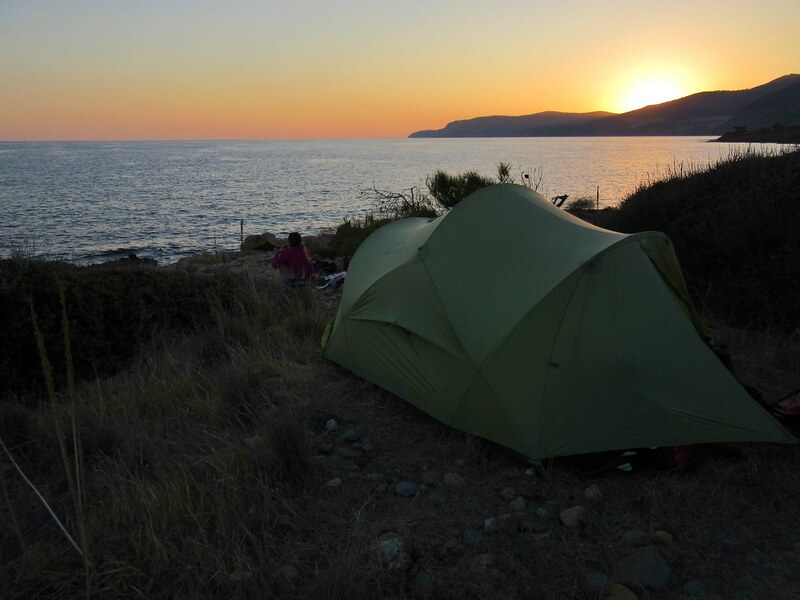 That evening we camped on a wide sandy beach and heard the wind really picking up through the night. 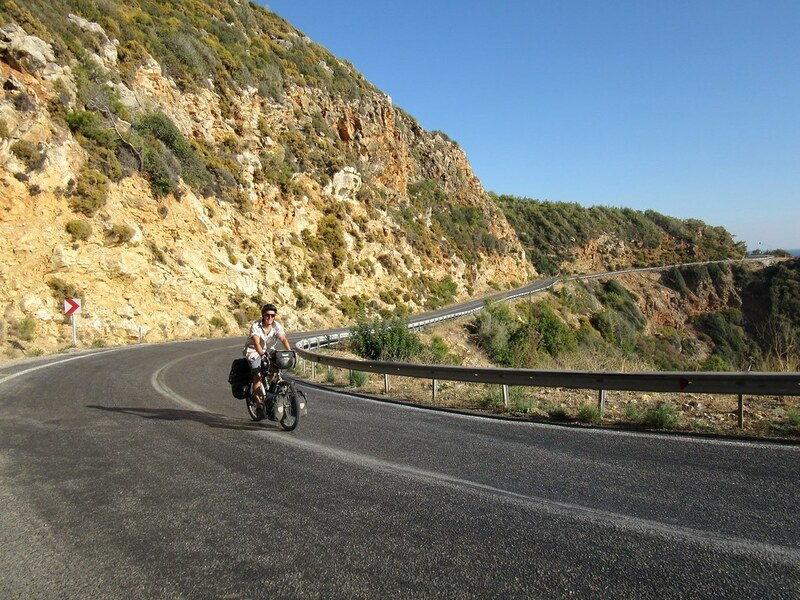 With the road winding through the cliffs, the wind came from all directions when we started riding, sometimes helping us, sometimes slowing us down further. 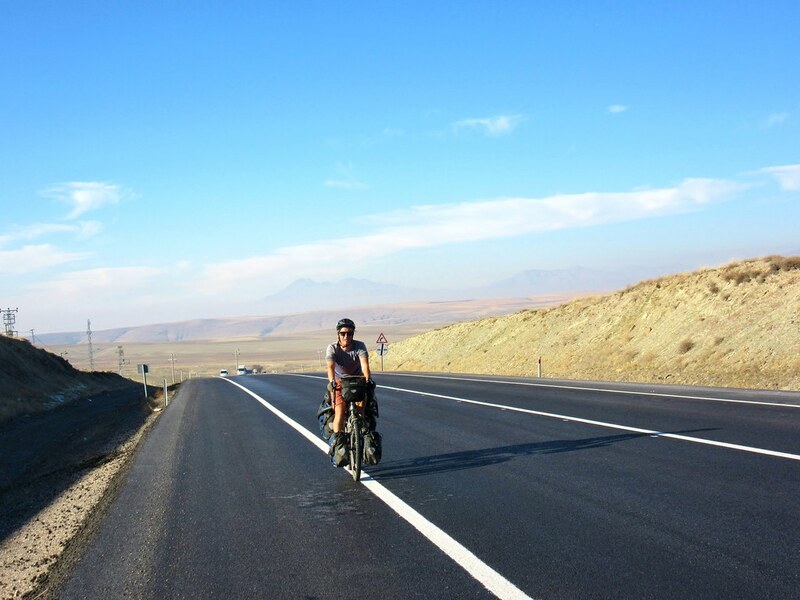 In the middle of one climb, the speedo ticked over 3,000km, which means we’ve now covered 17,000km on this trip. 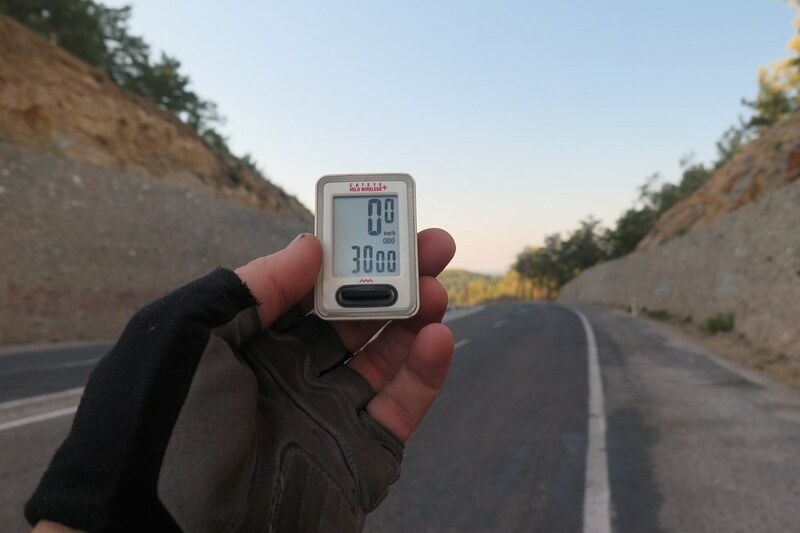 It doesn’t seem like long ago we passed the last milestone, we’ve been clocking up some decent distance so far in Turkey. 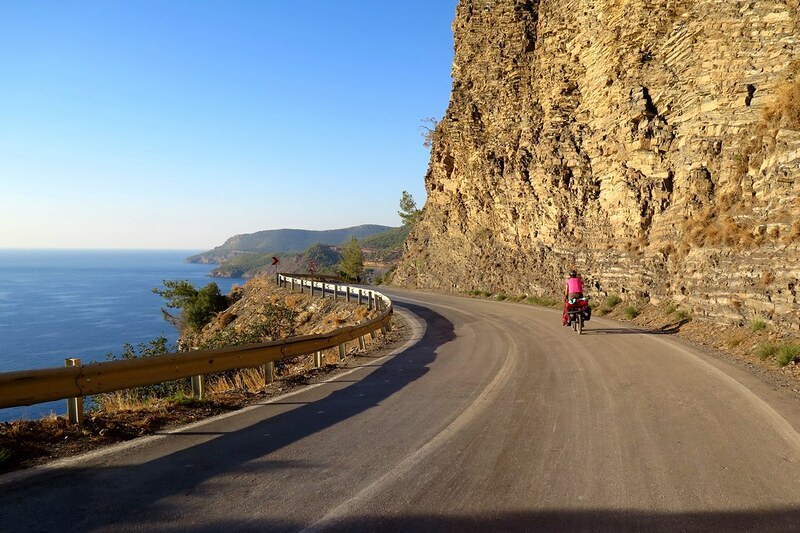 With about 100km still to go to Alanya, it looked like we had just one more set of switchbacks before we reached a flatter, straighter section of road. But it was a big climb, and late in the day, so it soon was clear we weren’t going to get up and over before it started getting dark. 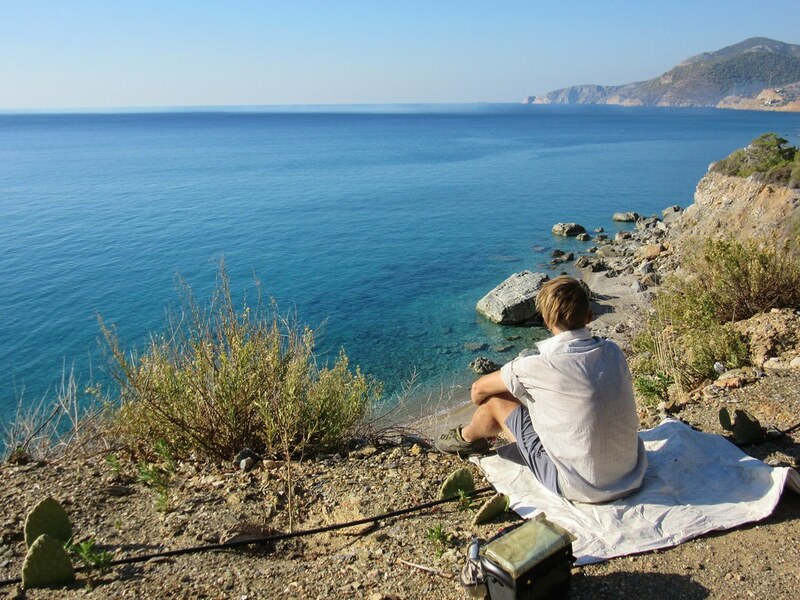 We started looking for places to camp, but on the steep hillside, there weren’t many options. The higher we got, the steeper the cliffs, but I spotted a flat patch in the middle of a hairpin bend above us. There was a guy selling bananas in the layby nearby, but he didn’t have any problem with us camping there. 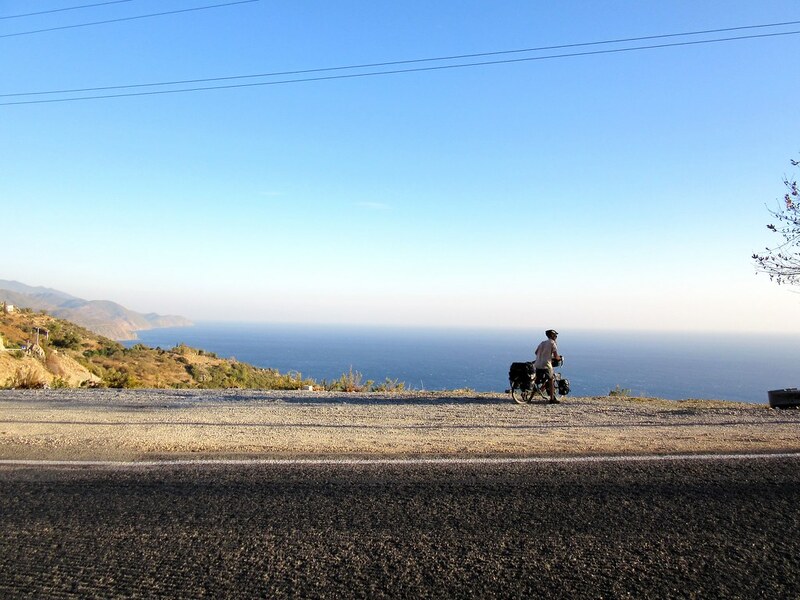 It was just big enough for the tent and our bikes, and the view down to the sea way below us was amazing. We had rain on the tent in the night, and some very strong gusts of wind. 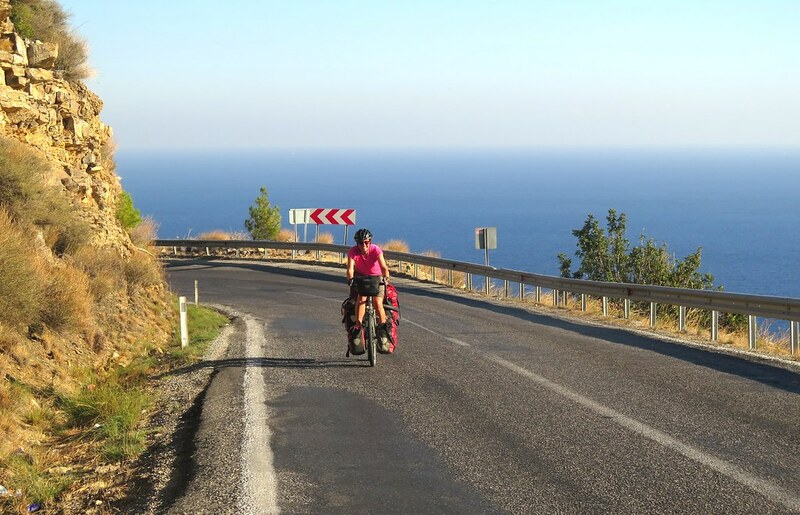 The final stretch into Alanya was about 75km, with a last bit of climbing and then a downhill to a flatter coast road into town. The sky was looking grey so we were racing to get there before any more rain fell. Luckily the wind was in our favour through the morning, so we were able to keep quite a good average speed, even with the early climbing. Once the road flattened out, we started passing more and more resort hotels and touristy shops. It’s definitely low season, and not a particularly good year for Turkish tourism in general, as most were closed or even boarded up. It definitely worked in our favour as we got an apartment on Air BnB for £8 per night. So we’ll stay in Alanya for 4 nights while the weather looks rainy, then continue onwards at the weekend when the sun should return. Beautiful, as always. Did both of you go for a swim, REALLY? You still haven’t lost fingers? Damn. 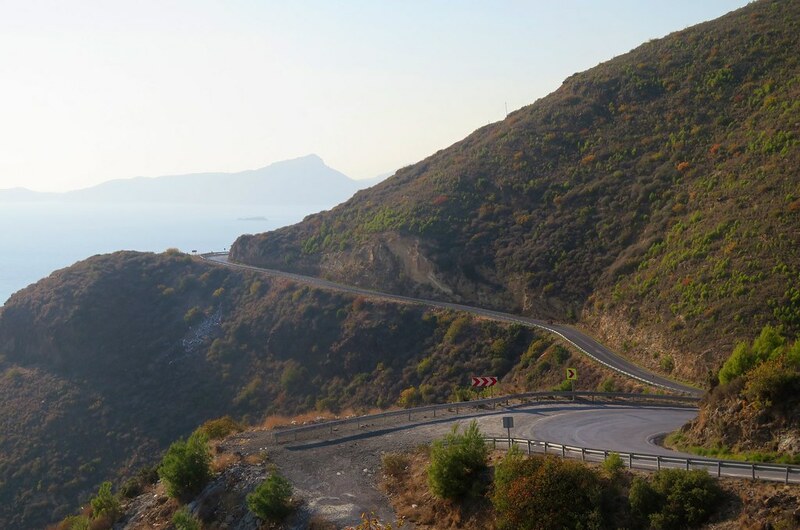 I remember the drive from Alanya to Mersin quite well – the roads were spectacular, but glad we were in a car for those ups and downs!